In between knocking on voters' doors in Rochester this afternoon, Congressman Walz talked about the moving experience yesterday at the American Legion in Austin, where he (a retired command sergeant major) led the promotion of James Hecimovich from master sergeant to command sergeant major, then awarded the Bronze Star for Hecimovich's service in Iraq and Kuwait. Walz spoke of the deeply emotional moment, and then spoke of the anger a vet displayed in the public meeting. Understanding the spectrum of of emotions ranging from pride to frustration was part of the job, Walz observed. We mentioned how vets we knew had schooled us about issues they face. Soldiers will die before Congressman Tim Walz, Command Sergeant Majors Norman and James Hecimovich and everyone who attended Friday’s medal and promotion ceremony and veterans forum at American Legion Post No. 91 in Austin. There have been 4,000 war casualties in Iraq and Afghanistan in the last six years of fighting; 72 of them with strong ties to Minnesota. Who doesn’t know someone serving in harm’s way around the world right now? The families of the Hecimoviches have prayed their loved ones would not die before they woke in multiple wars. James Hecimovich was twice deployed to active military duty in the aftermath of the terrorist attacks on America Sept. 11, 2001. His father, Norman, an Austin 3rd Ward City Council member, served in three wars: Korean, Vietnam and Operation Desert Storm. Just like today’s wars/conflicts go on, so does life and last Friday it was cause for celebration; not consolation in the lives of two soldiers. Walz, a 1st District Democrat, did it by-the-book Friday at Post No. 91. “Attention to orders?” Walz barked at the dining hall filled with veterans and others. The room came to attention and the congressman announced James Hecimovich’s promotion from master sergeant to command sergeant major. Then, Walz presented the newly-promoted soldier with the Bronze Star for meritorious service, during Operation Iraqi Freedom. Hecimovich served in Kuwait and Iraq. He thanked his family and Kingsland Public Schools, where he is an elementary and middle school principal, for their support during two deployments. The Kingsland superintendent, David Stroebel and Mitch Lentz, president of the school board, were present for the ceremonies. Watching was his father, Norman Hecimovich, a decorated veteran and past commander of the Legion Post as well as Austin Veterans of Foreign Wars Post No. 1216 and the Disabled American Veterans Chapter No. 27. The retired educator also serves as an ombudsman for veterans and their civilian employers. “He always said he was going to do better than his dad and it looks like he’s going to,” Norm said. . . .
Walz, who was elected to Congress in 2006, is the highest-ranking enlisted servicemen to ever serve in the U.S. House of Representatives. Like the Hecimoviches, Walz also holds the rank of command sergeant major in the Minnesota National Guard. During the two-week Easter break, Walz has been holding medal ceremonies and veterans forums throughout the 1st District. Of his three House committee assignments, agriculture, transportation and infrastructure and veterans affairs, the latter has seen his passion for patriots surface repeatedly. In other opening remarks, he said the nation has both a moral responsibility and an obligation to its security to take care of its soldiers. To him, it’s a given. “If you spend billions to put soldiers in harm’s way, you spend billions to get them out and then you have to take care of them, too,” he said. In a free-wheeling comment and question-and-answer period, Walz became a target at one point for criticism, when an unidentified veteran blamed him for not helping the veteran receive benefits. Walz took the obscenity-laced criticism unflinchingly. The questions ranged from the unfairness of disability ratings to the lack of mandatory full funding for the VA budget to arbitrarily taking benefits from Level VIII veterans. Another veteran urged the congressman to continue to push for enforcement of the Veterans Preference law to guarantee veterans their jobs upon returning home from active duty. While the congressman’s aides took notes to follow-up on veterans’ requests, Walz fielded more questions and heard more complaints. That was what he apparently wanted to happen. “The message has been wherever we have gone, ‘Take care of the soldier,’” he said. . . . Earlier this afternoon, when Walz stepped into the phone banking room, a volunteer handed him a phone almost immediately; she had just called a man who said he had two sons deployed in Iraq and she thought the congressman might want to thank him for his family's service to the country. Once he was off the line, Tim shared more about the family. One of the sons was home on leave because a very young child had died; the soldier only received ten days leave. Walz, the father of two young children, said he would have his congressional staff contact the Pentagon to see if the leave could be extended, then continued phone banking. Since listening to only half of a phone conversation isn't too exciting, we stepped over to the auditorium where the Olmsted County DFL had convened. Inside, John Pierce, an Army Reservist who served in Iraq and Kuwait, had just begun a passionate speech on Walz's behalf. He spoke first of getting involved in politics because of his disagreement with "national security policy when it came to Iraq." Brian Davis, on the other hand, states his Iraq policy as "we need to stay the course, we need to keep doing what we're doing and we'll have to keep our fingers crossed." We'll have to keep our fingers crossed. That's Davis's plan. Is that what I'm supposed to tell my mother when I have to break her heart again, when I get deployed for a third time? Well Mom, we have no cohesive Iraq strategy but Brian Davis and the GOP have their fingers crossed for me. . .
We talked briefly with Pierce after his speech and were able to get a copy of his words. He had written the text out before the GOP endorsement was known. Powerful stuff, indeed. 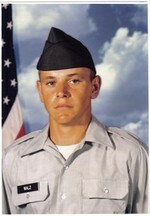 Photo: Portrait of Tim Walz as a young National Guardsman.